Browse our Article Collections – bringing together peer-reviewed content from across the Society’s publishing platform on a range of hot topics and subject areas. World Tuberculosis Day on 24 March recognises the date in 1882 when Dr Robert Koch announced his discovery of Mycobacterium tuberculosis, the bacillus that causes tuberculosis (TB). In celebration of this, we are excited to present a collection of recently published papers on M. tuberculosis. A collection of all Review articles published in 2019 across Microbiology Society journals. Review articles give a great introduction to a particular subject suitable for a wide audience, and are freely available for all to read. Over the last century, Streptomyces bacteria – and their metabolic products – have revolutionized modern medicine. These little pharmaceutical factories produce a vast array of natural products that have been co-opted for medical and agricultural therapies. In addition to their metabolic sophistication, Streptomyces also exhibit remarkable developmental and regulatory complexity. Guest-edited by Dr Marie Elliot, this collection of keynote research articles will highlight fascinating aspects of Streptomyces biology, and the advances that are providing us with newfound insight and appreciation for these extraordinary bacteria. This collection is now open for submissions - please submit here and state that your manuscript is part of the Streptomyces collection. This collection brings together original research articles, mini-reviews, and full-length reviews relating to Pseudomonas. Guest edited by Dr Joanna Goldberg and co-edited by Dr Kalai Mathee, this collection will not only be relevant to scientists with an interest in Pseudomonas, but also, due to the widespread use of this genus as a model for studying multiple systems, it will be of general interest to other researchers active in areas such as evolutionary biology, communication systems, genomics and biofilm research. In addition, because P. aeruginosa is a key pathogen associated with both acute and chronic infections, and particularly important in the context of cystic fibrosis and antimicrobial resistance, the collection will be of interest to clinicians and clinical researchers. This collection is being run in conjunction with Pseudomonas 2019, an international conference in Kuala Lumpur, Malaysia, and welcomes articles from participants and non-participants. We are delighted to present a collection of the Microbiology Society’s most downloaded journal content from January–September 2018. This collection highlights the exciting and impactful research across the breadth of microbiology and is an easy way for you to quickly access the content your peers are reading. This collection highlights Outbreak Reports published in Microbial Genomics. Outbreak reports are short-format articles that investigate the key role that genomics plays in investigating communicable disease outbreaks. If you would like to see your work included in this collection click here for more information. Microbial Genomics is looking for novel and interesting stories describing unique applications of genomics at any stage of an outbreak. In 2017, the World Health Organisation published a list of antibiotic-resistant bacteria that pose the greatest threat to human health. This publication was compiled to help guide and promote research and the development of new antibiotics, and lists 12 families in order of research priority. In an effort to help raise the profile of these important pathogens, Microbial Genomics has commissioned a series of mini reviews on the bacteria included in this list. Articles will be published as they become available over the course of the next year and will be put into a special collection named ‘WHO’s 12’. For enquiries please contact [email protected]. Microbiology is now publishing ‘Microbe Profiles’ – concise, review-type articles that provide overviews of the classification, structure and properties of novel microbes, written by leading microbiologists. These profiles will provide insights into key microbes within the field. The profiles are fully citable and freely available, and will make an excellent resource for education or reference. 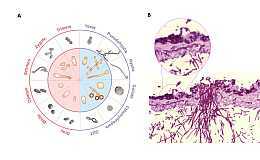 In celebration of World Microbiome Day on 27 June, the Microbiology Society and the British Society for Immunology have collaborated to curate a freely available collection of microbiome research articles published in our journals. This unique collaboration breaks traditional disciplinary boundaries, bringing the microbiology and immunology communities together over shared interests. Articles from the British Society for Immunology can be found here. The full collection can also be viewed on Science Open. Our co-published Editorial, written by Julian Marchesi of Cardiff University and Imperial College London, and Chair of the Unlocking the Microbiome report, about the landscape of microbiome research on World Microbiome Day, can be found here. Antimicrobial resistance (AMR) is a cross-disciplinary issue, with ground-breaking studies currently bringing together clinicians and modellers, veterinary and soil scientists, microbiologists and anthropologists. Yet finding a home for the unique publications from this research is difficult. The Microbiology Society is providing such a home with a new pop-up journal for cross-disciplinary research on antimicrobial resistance: X-AMR. We invite submissions in the form of research papers, mini-reviews or commentaries. For more information on X-AMR, including how to submit your article, see our FAQs page. Included in this collection are a host of antimicrobial resistance papers already published across our portfolio. The latest X-AMR articles will appear as and when they are published. Read our Guest Editors' introductory Editorial here. Curated by Journal of General Virology Editor Dr Eng Eong Ooi (Duke NUS Medical School) and Advisory Board Member Dr Esther Schnettler (Bernhard Nocht Institute for Tropical Medicine), this collection presents the latest advances in arbovirus research. This collection was launched in conjuction with IMAV 2017 and in line with IMAV 2019 welcomes submissions of original research articles, Insight Reviews and full-length Reviews. Find out more about how to submit to the collection here. Editor’s Choice articles are the pick of each issue of Microbiology as selected by a different Editor each month. They are free to access for one month after publication and are accompanied by a short summary explaining the key points of the paper. A collection of all Review articles published in 2018 across Microbiology Society journals. Review articles give a great introduction to a particular subject suitable for a wide audience, and are freely available for all to read. A collection of all Review articles published in 2017 across Microbiology Society journals. Review articles give a great introduction to a particular subject suitable for a wide audience, and are freely available for all to read. Journal of General Virology ICTV Virus Taxonomy Profiles are a freely available series of concise, review-type articles that provide overviews of the classification, structure and properties of individual virus orders, families and genera. ICTV Virus Taxonomy Profiles are written by the International Committee on Taxonomy of Viruses (ICTV) study groups, comprised of leading experts in the field. The profiles summarise the individual chapters from the ICTV’s online 10th Report on Virus Taxonomy, and provide the latest taxonomic information on viruses. The Microbiology Society is publishing these citable profiles online, while the full chapters are available to all through the ICTV website, thanks to a five-year Biomedical Resources grant from the Wellcome Trust. In 2005, the mystery was unveiled: CRISPR cassettes witness genetic intrusions. Researchers, notably microbiologists, eventually confirmed CRISPR-based adaptive immunity and deciphered the underlying mechanism. Multiple uses emerged from this basic study on the biology of prokaryotes. DNA-manipulation tools were implemented with components of this immune system, triggering an unprecedented revolution in science. This collection presents high quality work on CRISPR. For more information watch the Microbiology Society on "What is CRISPR Cas?" . This collection presents high-quality work on important avian pathogens and their host interactions. The collection is curated by Journal of General Virology Editor Professor Paul Britton and Editorial Board Member Dr Mike Skinner. Antimicrobial resistance (AMR) is an increasingly serious global threat to the effective prevention and treatment of common infections caused by bacteria, parasites, viruses and fungi. For more information on AMR please review the Society’s briefing on the topic. This collection has been created using published articles on AMR from the following peer-reviewed Society journals; Microbiology, Journal of Medical Microbiology, JMM Case Reports and Microbial Genomics. To celebrate the 70th Anniversary of the Microbiology Society, Editorial representatives from each of the Society’s journals have selected seminal articles from their publication that have made important contributions to microbiology over the years. The curators have written commentaries explaining their selections which can be read here.